A pulled elbow is a common injury in children aged between 1 and 4 years. It usually happens after a sudden pull on the child's lower arm or wrist, for example when someone lifts them by one arm. 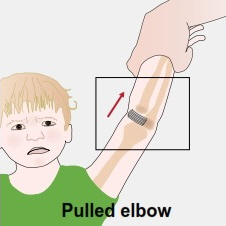 If your child has a pulled elbow they will usually cry straight away and not use their arm. They will often hang the arm by their side. Why does pulled elbow happen? Children have weaker ligaments (short bands of strong, flexible tissue that connect joints) than adults. In pulled elbow a circular ligament that wraps around the top of one of the bones in their forearm, the radial bone, stretches and pulls out of place. This causes pain until the ligament goes back into place. A doctor or nurse should treat a pulled elbow. They will usually move your child's arm in a particular way to put the ligament back in place. They can do this quickly. Your child might be surprised at first, but then the pain should get better, so your child goes back to using their elbow as normal within a few minutes. Your child will not usually need an X-ray to diagnose a pulled elbow. The doctor or nurse will usually watch them for a short time after treatment to make sure they are using their arm without any problems. If they are still in pain or not using their arm they might need an X-ray to see what's happening. Once your child's ligament is back in place their arm should not be painful. Some children may be a little sore and need some paracetamol. After treatment your child can continue with life as normal. They don't need a sling and you don't need to stop them from playing in any way. To prevent pulled elbow in the future, try not to pick up your child by one arm. Teach other caregivers to do the same. your child is in pain and doesn't get better with paracetamol. If the injury happens again do not try to treat it yourself. Always seek medical attention. If you have any concerns phone the Orthopaedic Outpatients Department on (03) 364‑0800 ext. 88692 or contact your GP. Written by Orthopaedics Outpatients Department, Canterbury DHB. Adapted by HealthInfo clinical advisers. Page created June 2015.